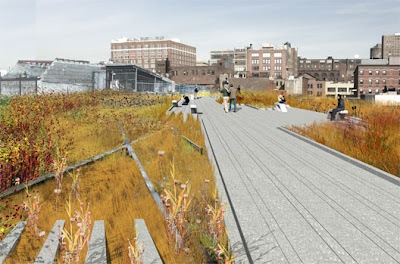 Continuing the coverage of NYC's High Line project, which has been featured in detail here, and minimally here, as well as a study of one of the precedents in France here... Curbed has a multi-part feature showing the project evolving from idea, with some new renderings of Phase II. I'm trying to track down some current construction shots of Phase I - which is coming to fruition. Starting with some of the new renderings. 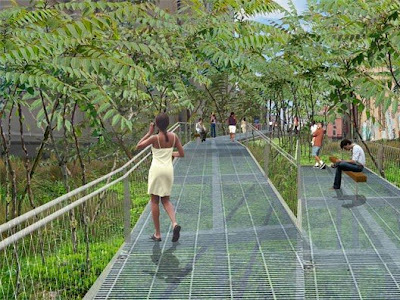 Via Curbed: "This morning, for the first time since 2005, we were blessed with new images of The High Line. 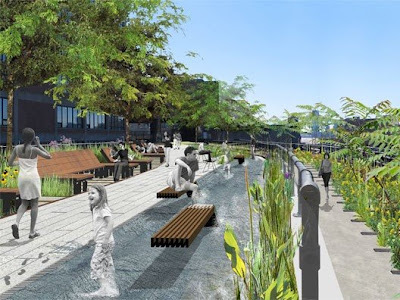 ...we have the new sundeck water feature at the 14th Street bend, which features half an inch of running water for barefoot frolicking (and, when the weather's cold, becomes just part of the planking)." "The Standard Hotel is attacked by giant seagulls! 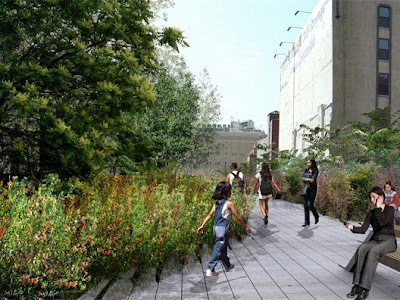 That's just part of the fun at the Gansevoort Woodland and Washington Grasslands that comprise the segment just to the north of Gansevoort Street (this rendering looks north)." "...10th Avenue Square from above. 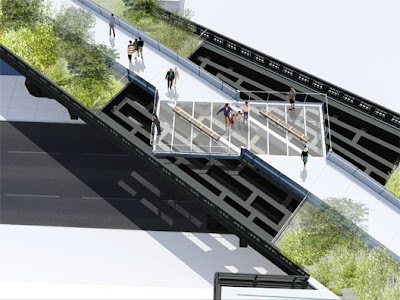 This is definitely one of the major highlights of Phase I, especially if you like ramps to recline on." Finally, "An oldie but a goodie from the '05 vintage renderings release, again looking north." 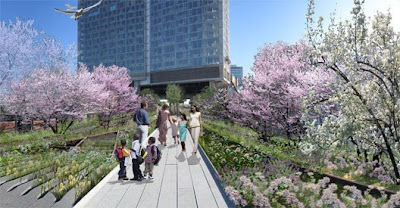 Continuing from Curbed, Pt.2, some additional new images. 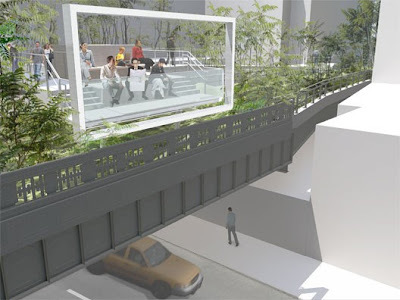 My favorite below, "The Woodland Flyover, which runs between 24th and 27th Streets, lifts pedestrians off up the High Line bed and sends 'em soaring into the, er, sumac trees. The sumac trees, which officials assure us are only poisonous to certain human beings, echo the old sumac grove that grew here back in the day. This is all part of a microclimate, it seems, which doesn't make this whole thing any less jaw-dropping." And some more eye candy - enjoy... 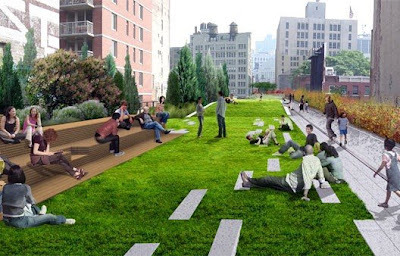 Check out Curbed for more full High-Line coverage. 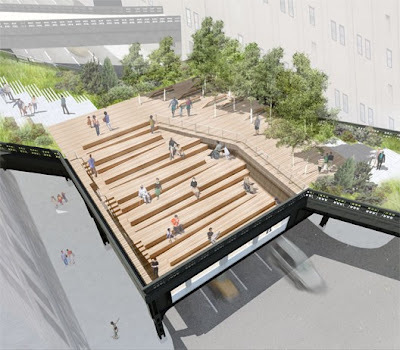 Finally, a big new move, the 30th Street Cutout: "Another highlight of today's announcement was most certainly the 30th Street Cut-Out, in which the High Line's concrete deck is cut away to show beams, girders, and whatever the heck sort of illicit behavior is going on down at street level."